Following are my estimates of the attributes a nonprofit board needs to be considered a high performing board in the 21st century. •	Operating managers consider themselves primarily professional managers, not mission specialists. •	The board chair and the operating CEO have a trusting relationship and a clear understanding of the responsibilities each has. Management’s responsibilities are clearly clarified. •	The board and managers constantly look for more effective and efficient ways to serve its clients. •	The board is a continuing source of out-of-the-box (generative) thinking. •	Board is constantly alert to the dangers of micromanagement. 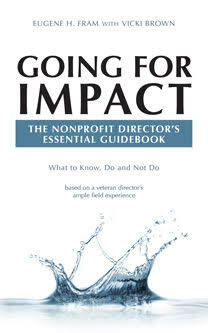 •	Keeps directors involved while they focus on strategy development, planning and generative thinking. (These activities are not as inherently interesting as overviewing operating activities.) The board chair and management have to make certain that board members perceive strategy development, planning and generative thinking are making contributions to the organization. •	Each group has a well-understood role. •	Each understands the others deserve respect and are persons of good will trying to meet the needs of clients. •	Measures of outcomes for management and staff are considered robust but fair. •	Members are comfortable with reviewing financial & management issues. •	Signals to all concerned that the board is active in preventing fraud.